Two surveillance flight tests using mock B61-7 and B61-11 nuclear bombs were successfully carried out in the Nevada desert several weeks ago, according to a release last week. The mock bombs did not carry any nuclear devices but instead recorded information on how the bombs performed during the test runs. The tests were jointly conducted at Tonopah Test Range by the U.S. Air Force’s Global Strike Command and the National Nuclear Security Administration (NNSA). 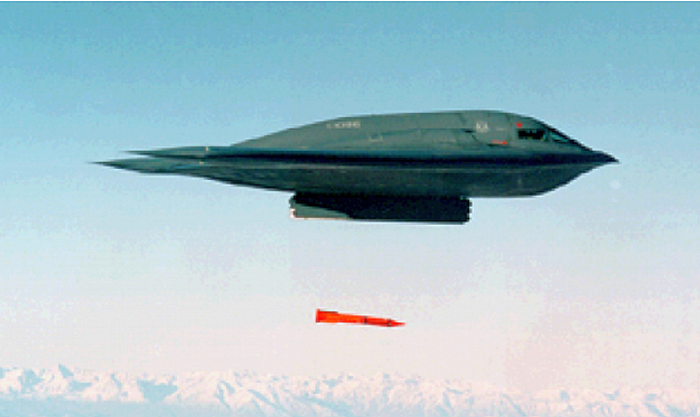 Two B-2A Spirit stealth bombers dropped the mock bombs to “allow scientists and engineers from national laboratories to assess their performance” and they “contain no nuclear materials and are not capable of nuclear yield,” the NNSA said in a news release on Oct. 6. Engineers and scientists with the NNSA will then use data collected from the tests to conduct computer simulations to look at the weapon systems’ reliability to see if they are working as designed. The B61 nuclear bomb is one of the thermonuclear weapons in the U.S. weapons stockpile following the end of the Cold War. It adds that an attempt to use it in an urban setting would result in untold civilian deaths and injuries. “Even at the low end of its 0.3-300 kiloton yield range, the nuclear blast will simply blow out a huge crater of radioactive material, creating a lethal gamma-radiation field over a large area,” the FAS says.